Just a little one, but Turnado now supports landscape as well as portrait. Wait! What’s this? Well, here it is! “Turnado.” That’ll do very nicely. A massive live effects rack focused more on tripping out beats, but just as awesome for any sample to mangle. This thing is ridiculous. Insane. Massive. Insert your favorite exclamation of joy . Easy & packed deep with very interesting effects of all kinds. This cavern full of effects fits nicely on the iPad in portrait view. Understandable at first look. Not overly complex. Its deceptively simple, with a wild multitude of adjustable parameters to lose oneself in a bottomless pit of effects possibilities. I mean this thing is deep! Getting started is a snap. 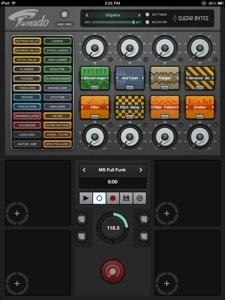 Just tap the presets menu and select one, or tap the dice ( die ) to randomly generate 8 different FX that you can control simultaneously with either the 8 associated effects knobs, or the 4 X/Y pads controlling 2 FX at a time correlating with those knobs. Select a factory sample, loop it, and just boogie with the 4 pads live. 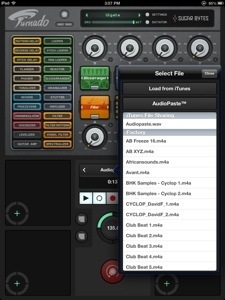 You can also drag FX units from the list of 24 professional grade algorithms, and drop in whichever slot you like. Great also for quickly replacing something. Turnado is immediately satisfying and crazy fun. This is only the beginning though. Beyond the easy start, you can dig way further into each of the effects to make some very cool sounds. This is modulation tweaking paradise. As good as the factory samples are, nothing beats your own. Loading from the many FX carefully designed presets that fit pretty much any occasion is sweet for a quick run. Where Turnado really shows itself off is in the individual FX “Edit” screens. You’ll notice that each of the FX units have a little “Edit” button on them. Go ahead, tap it! Whammo! Adjustable parameters galore. Welcome to the modulation candy store. Now you have all the pieces that make the effect live and breathe. You can easily end up in a vortex where time stands still with the amazing amount of sound options here. Imagine it, tweak it, and experiment with it all. 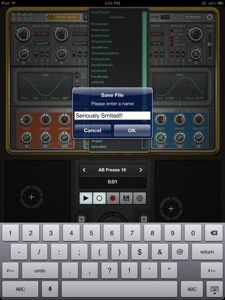 I’ve spent many hours in this screen creating numerous presets of my own. There is so much to discover. Once you find and hear what you like save it to call up from the user list. The portion of the screen where all the editing is done can feel a bit tight, and small. No problem, double tap it and it zooms in. The zoom can also be disabled if you wish. The FX are pretty amazing. As I mentioned already they are high quality, and focused on beat manipulation more than anything else. 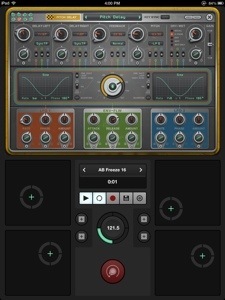 You’ll find numerous filters, slicers, loopers, wobblers, and so on. 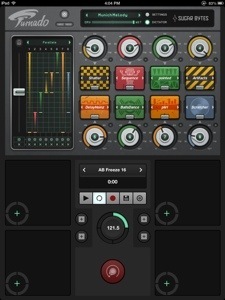 No worries if, like me, you would like to use Turnado for more than just beats. It is complete with excellent delays, and reverbs to boot. 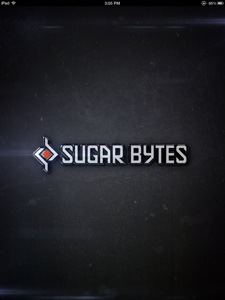 Sugar Bytes thought this through offering so many FX types, styles and options. They created a fantastic controller called “Dictator” that can control each of the 8 FX knobs and countless parameters with a single slider. This is a real treat and leads to some monstrous sound designs. 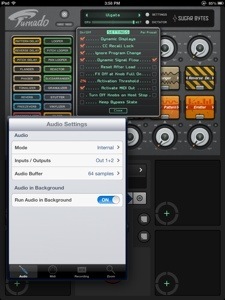 Again, the Dictator is customizable and offers lots of preset configurations. Its unique, powerful and just plain crazy. I can’t find anything terribly serious to complain about. The only issues I experienced using Turnado on iPads 3&4 were with the edit screen. It has during playback caused unwanted skipping or stuttering with each touch of that screen. A few times when I was really pushing Turnado hard by working all the FX at once, I temporarily lost audio. Only one crash on my iPad 3. These could be a problem in a live performance, not so much in your studio. Its early yet for the iOS version of Turnado. I don’t expect these to linger. Sugar Bytes is quick to make fixes as demonstrated with a recent update already fixing some minor bugs. I’m not worried, and it doesn’t effect my feelings on this incredible app. You will definitely have lots of fun.